America is home to many international airports, from John F. Kennedy in New York City to Hartsfield-Jackson in Atlanta. 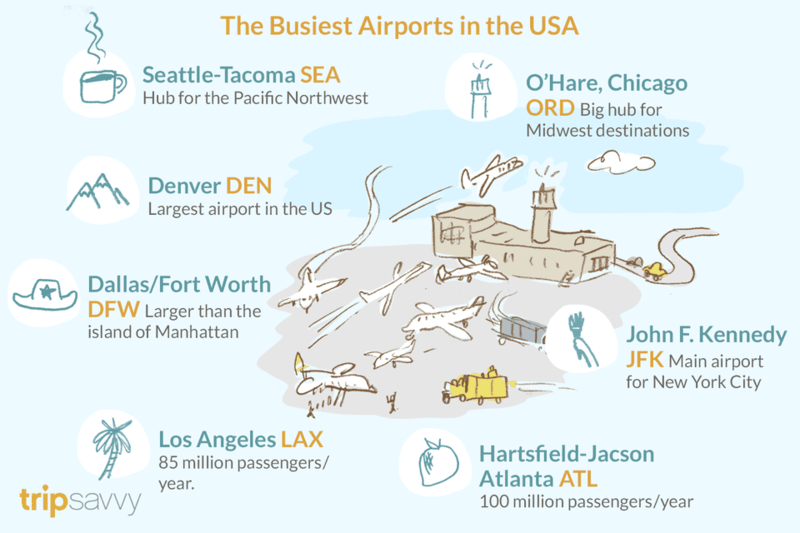 These airports serve as main hubs for big carriers such as United, American, Delta, and JetBlue. Although they can get busy (especially during holidays and peak seasons), the bigger airports tend to have the most direct international and domestic flight routes, which make it faster and more convenient to travel. Plus, they're usually more affordable compared to flying through small regional airports—meaning they're more than worth braving the crowds. Atlanta's Hartsfield-Jackson beats out Beijing as the busiest airport in the world, with more than 100 million passengers a year. It is conveniently located, just a two-hour flight from many large American cities, making it an easy, central layover for connecting flights. It's also the main hub for Delta Airlines. O'Hare was the busiest airport in the United States until Atlanta's Hartsfield-Jackson took that title away in the late 1990s. O'Hare is a major connecting airport for destinations in the Midwest and is a hub for United Airlines. Besides being the main airport for travelers visiting L.A., Hollywood, and Southern California, Los Angeles International handles many connections to Hawaii and the West Coast. LAX sees roughly 85 million passengers a year. It is the largest of five airports in the area, including Hollywood Burbank, Long Beach, John Wayne, and Ontario. Dallas/Fort Worth International Airport is the busiest airport in the state of Texas. The airport spans more than 17,000 acres and is bigger than the island of Manhattan. Because of its size, it has its own postal code and post office. DFW is a hub for American Airlines. As the main airport for New York City, JFK sees arrivals and departures from almost every international airline in the world. JFK handles most international flights while LaGuardia Airport (also in Queens) is more popular for domestic flights. American Airlines and Delta Airlines have a large number of connections through JFK, as does JetBlue. With more than 33,500 acres (or 54 square miles) of space, Denver International Airport is the largest airport by area in the United States. Many regional carriers, particularly Frontier Airlines and Southwest Airlines, connect to DEN. Travelers visiting the western states of Colorado, Wyoming, Utah, Idaho, Montana and New Mexico will likely travel via Denver. San Francisco International Airport is the second largest airport in California and connects West Coast travelers to Europe and Asia. It was the base for Virgin America, which was acquired by Alaska Airlines in 2016. SFO has won awards for its green design and efforts to reduce waste, water use, and greenhouse gases. San Jose and Oakland airports are also convenient alternatives to San Francisco International. Although Las Vegas' glitzy casinos are close by, travelers need not leave the McCarran International Airport to gamble, as there are more than 1,300 slot machines available right inside the terminals. Airlines that serve LAS include low-cost carriers like Southwest and Spirit, as well as United, American, and Delta. Serving Phoenix and the greater Southwest area, Phoenix Sky Harbor has 120 gates in three terminals. It's also known to be an extremely friendly airport thanks to its stellar customer service. The main airlines here are American Airlines, Delta, and Southwest. United Airlines' largest hub is at George Bush Intercontinental Airport, but it is far from the only carrier that services this busy Texan airport. Alaska, American, and Delta airlines also service the airport. Routes between IAH and Central and South America tend to be the busiest. This airport in North Carolina connects a string of cities along the East Coast. For flight transfers, CLT is often a common alternative to Atlanta's Hartsfield International Airport. It is well known for the rows of rocking chairs that line the main hall and provide a relaxing way to spend a layover. CLT is a hub for U.S. Airways and United. Miami International Airport is the main U.S. gateway to Latin America and the Caribbean. MIA has the largest number of global passengers after New York City's JFK International Airport. American Airlines has many routes to this major Florida city. Alternate Miami airports, such as ​West Palm Beach Airport and Fort Lauderdale/Hollywood International Airport, are good backup options if you can't find your preferred flights out of Miami. Visitors to Walt Disney World and the surrounding theme parks make Orlando International Airport one of the busiest airports in the U.S. Many regional and low-cost airlines serve MCO, including Southwest and JetBlue. Although Newark Liberty is located in New Jersey, it serves as one of New York City's three main airport hubs. In 2016, it underwent a $2.3 billion renovation of Terminal A, which was built back in 1973, to handle the 38 million annual travelers. It often offers cheaper flights than its neighboring JFK and LaGuardia airports. Locals call this airport SEA-TAC. In addition to being the main airport for points in the Pacific Northwest, SEA-TAC is a hub for Alaska Airlines. It is conveniently located 20 minutes away from downtown Seattle. Delta Airlines has a major hub at Minneapolis/St. Paul Airport. In addition to the twin cities of Minneapolis and St. Paul, Minnesota, MSP handles passengers going to and from destinations in the Upper Midwest, including Wisconsin, Michigan, and North and South Dakota. Although the name makes it sound like a regional airport, DTW is actually an international airport and is Delta Airlines' second largest hub. PHL serves the city of Philadelphia but is also an ideal airport for passengers from Pennsylvania, southern New Jersey, and the Delaware Valley. Philadelphia International Airport is less crowded and more affordable than the three major New York City-area airports, JFK, LGA, and EWR, for those who don't mind the 1.5-hour drive. Boston's Logan International Airport is the main gateway for New England states, such as Rhode Island, Maine, Vermont, and New Hampshire. Delta, JetBlue, and American are all popular carriers at Logan, and often offer ​great discount flights from here. Although Fort Lauderdale International Airport can be an alternate to Miami (it's approximately 20 miles north of Miami), it's also an ideal entry point for those visiting the beaches of south Florida. Southwest, Delta, and JetBlue are some of the major carriers at FLL. Located south of Baltimore, BWI is often used as an alternate airport for travelers visiting Washington, D.C. which is only one hour and 20 minutes away. BWI is a major East Coast hub for Southwest Airlines. Located in northern Virginia, Dulles is the main international airport for Washington, D.C. while the capital's primary domestic airport is Washington Reagan National Airport. United Airlines frequently operates out of Dulles. A hub for Delta Airlines, Salt Lake City International Airport serves many connecting flights to western destinations, in particular, ski resorts. The popular Park City resort is only 45 minutes away. Chicago's smaller airport is an alternative to the city's busy O'Hare International Airport. Southwest Airlines has the largest presence at MDW.